the newest patterns are finally here! The Clara Dress, Gathering Apron, Esme Top, and Simple Skinny Jeans patterns are in my hands, ready to package up and send to you! 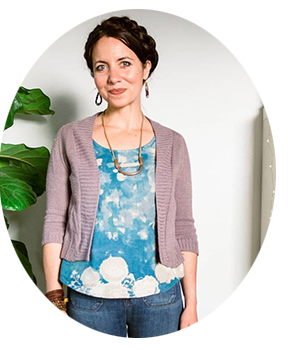 There's a big "first" with this spring collection - all four patterns include a full-length video tutorial along with the standard written instructions. Thanks to my darling intern, Danica, who stars in the videos and walks you through the construction of each. Oh my. I think I've succeeded in designing "The Meg Dress," as my mom would call it. It's super comfortable with its elastic waist, plus it has pockets to hold all of Finn and Lachlan's treasures. I have my spring dresses in the line up already here in North Carolina with the help of tights and a cardigan. The sample shown is made in a Japanese double guaze cotton. I'm loving the possibility of it in this fabric, with my mustard tights and cowboy boots. Totally made with the feathered ladies in mind. Also while daydreaming about all the produce I'll be able to gather this summer and fall from my garden. 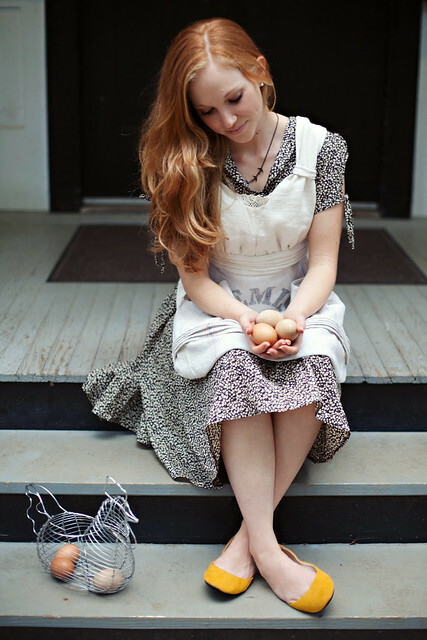 Did you like the Emmeline Apron? The Gathering Apron wins, hands down. It has a HUGE front pocket (the entire skirt is one big pocket) and the adjustable bust details make it super flattering and really accommodating of all sizes. Looks amazing in all of Kaffe Fassett's Shot Cottons. 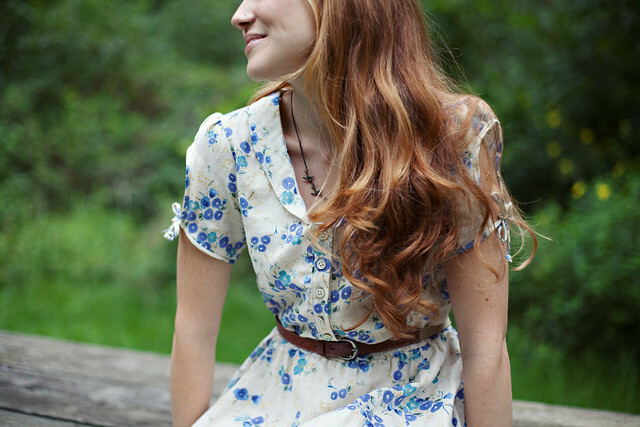 A sweet, go-to top that will surely rival the Schoolhouse Tunic. 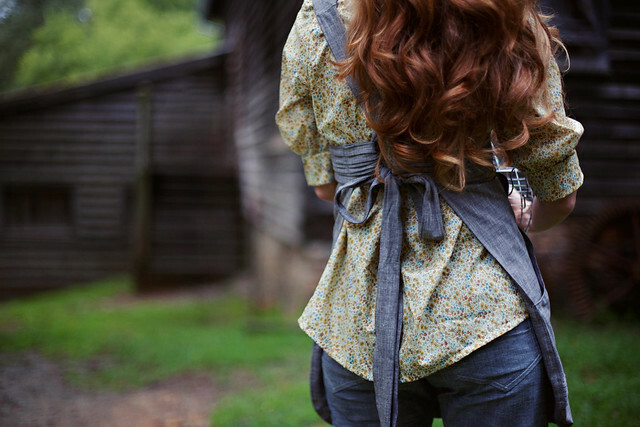 It's easy to make and easy to wear, and goes great with the Simple Skinny Jeans. My favorite versions are made in the new rayon challis substrate that Westminster Fibers has - particularly Valori Well's Novella. This fabric is so soft and hangs so beautifully. Novella's understated prints work perfectly for highlighting the simple details of the Esme. Really. They are SO simple to make. Think leggings, but with jean-like back pocket detail. These were modeled after my favorite pair of maternity transition pants, which had a wide elastic waistband, giving them a comfortable fit all the time. I'd suggest making them in a stretch denim or stretch chambray. Lura's Fabric shop has a great selection of stretch denim, plus you can order swatches to make sure you get the color you're looking for. I've also had luck finding good stretch denim at my local Hancock Fabrics. Stretch denims aren't knits, they're wovens, but they have some spandex/Lycra content which makes them movey and groovy - exactly what you want in a pair of skinny jeans. Thank you to Jessi for the wonderful photography! sizes 2-20, and bust sizes A-D. Eeee! That's right - the pattern includes separate bodice patterns to go with your cup size, so most sewists won't have to bother with bust adjustments! 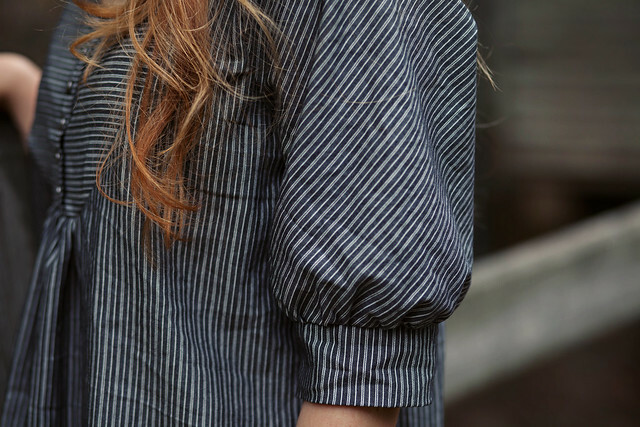 three sleeve variations make it an all-season pattern: elbow (shown above) sleeveless (shown below) and 3/4 sleeves. shorten the skirt to make a tunic/shirt version. 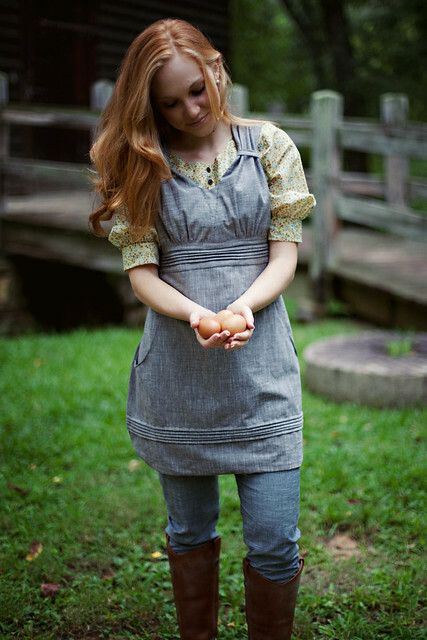 If you liked the Schoolhouse Tunic pattern, I really think you'll like the Ashland. Soon, I'll be posting video tutorials on how to insert an invisible zipper, like the one used in the Ashland, as well posting links to great buttonhole how-tos, so that you can take your sewing skills to the next level without any hair pulling! 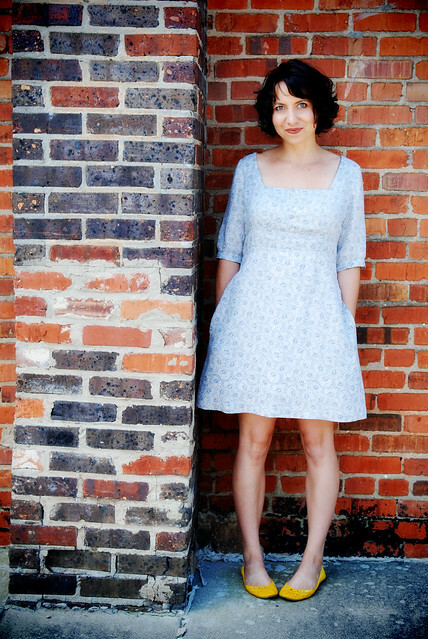 Ashland Sundress: fabric - French milled, cotton poplin, found locally at Mulberry Silks in Carrboro, NC. Okay, friends. I need your help now. I'm a rather busy bee nowadays, preparing for a VERY EXCITING online course I'll be filming in Denver in a few short weeks. (Any guesses? :) I haven't had time to source fabrics yet for Ashland fabric kits. How about this ... leave a comment with your favorite Ashland-worthy fabric (a link to the exact fabric in the comments would be helpful) and, if I pick YOUR fabric for inclusion in a kit, I'll send you a free Ashland Dress pattern! (Or give you a refund if you want to go ahead and get one now.) Cool? Cool. High fives all around. P.S. The patterns should be ready to ship by the end of the week, so expect yours to leave the North Carolina countryside by Friday, June 22nd or Monday, June 25th.